Give (or get!) One of the World's Most Expensive Fragrance Without Spending a Fortune! Ladies, have you heard of the new fragrance Halo by VECNY? Unless you follow Forbes' list of the world's most expensive perfumes, chances are you haven't! 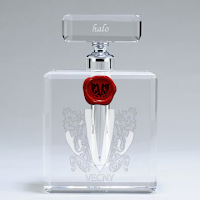 Halo by VECNY lends a unique, spicy air to floral undertones with a touch of tartness, encases the wearer in a light, luxuriously fresh aroma with just a hint of sweetness and induces a warming vanilla wisp. The most notable notes in Halo are the kaffir lime and acacia top notes, jasmine and barley heart notes followed by resonating benzoin and palisander base notes. At a whopping $7,986 per 100 ml bottle, Halo is the 3rd most expensive perfume in the world (per ounce) and the 2nd Most Expensive In the World per 100 ml bottle. I spend the day sharing some of the best deals I find with you, so you may be wondering why I am posting about this product. Well, it just so happens that people like us can actually afford to purchase this fine fragrance! Halo is the only fragrance of the top ten most expensive luxury fragrances that offers a 1 ml-sized bottle. Not only is this size bottle compliant with TSA regulations, it is priced at an attractive cost of $45.54. The 1 ml travel size bottle, while not a large amount of perfume and absolutely perfect for travel, is great as a gift and can last several weeks upwards of a month with daily applications (varies per user). The small bottle comes in a very attractive gift box and has a lovely wax seal of authenticity on it. I had the opportunity to experience this perfume myself and let me tell you, not only did it smell amazing, just knowing that I was wearing such an expensive fragrance made me feel great! It has a very nice smell and thanks to the unusual fragrance notes, a very unique one. It comes in a roller-ball type of bottle so you don't use too much of it. A little really does go a long way! I got many compliments throughout the day and a lot of people asking what it was. Of course, nobody had heard of it, but they were amazed when they found out what it was. I know I don't have many readers that are men, but if you're one of them, I encourage you to think about giving Halo to the lucky lady in your life this holiday. Can you imagine the look on their face when you tell them what that little bottle is filled with?! I actually think it's more expensive per ounce than gold is! Ladies, if you would love to receive this fragrance as a gift, you could direct your guy to this post or, less obviously, leave the Halo product page open on your monitor (hint, hint!). Although, bluntness could probably work as well. If your hints or request go unfulfilled, you could easily purchase it for yourself; consider it a splurge! I received a 1ml bottle of Halo by VECNY in order to form an opinion of the product and be able to write this review. No other compensation was received, and all thoughts and opinions are 100% my own. Um, seriously?? I could buy a freaking car for that amount of money, a really good one. Why would anyone spend that much money on a perfume? It is nonsense! Indeed, it is VERY expensive but there are some people out there who can afford it. For the rest of us though, they created the travel-sized bottle so we can enjoy it as well....without breaking the bank!